It’s lovely to meet the new cats coming in this month. We are full for the whole month and over half full for March already. We have a range of different cats and different breeds coming to stay. We have just had our first hairless cat, a Peterbald called Baggins. He was such a big character and we all totally fell in love with him. We keep the heating on 24hrs a day and it is a constant 22 degrees or 71 in Fahrenheit. He was toasty warm in his suite and we missed his lovely personality and cuddles when he went home. February brings more kittens, which are always so much fun and also a couple of real senior citizens – so much to look forward to. We have had another newspaper out today and as usual they couldn’t believe their eyes! We do love seeing people’s first reaction to the hotel, I guess we are so used to the cats having such luxury that it is second nature to us. We have added a couple of new DVD’s to the cats personal selections. These DVD’s are designed especially for cats and we had one of our guests meowing to the cat on the TV today, they are so amusing and we certainly love our job ♥. We are having our hallway turning into a giant virtual fishpond soon and I can’t wait to show you the videos. 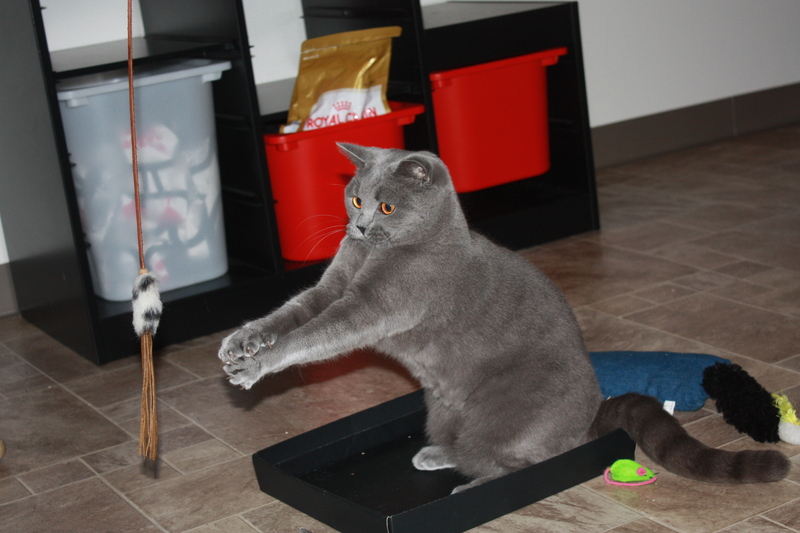 We love searching for new ways to keep the cats entertained and they certainly keep us on our toes. We have a family of four young Bengals and Bengal crosses who come to stay, they are such a fun family and always come armed with new toys. Their best one has to be a pirate ship, we love it! 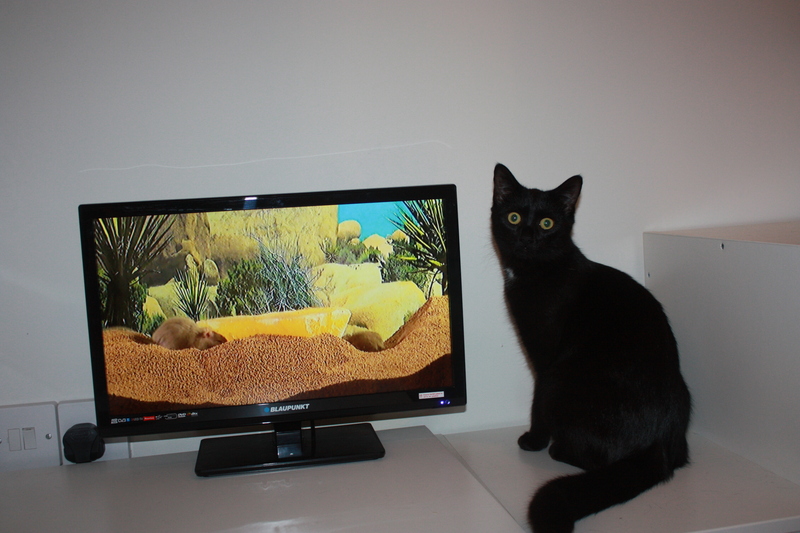 They love the interactive DVD’s and Luna in particular can be found hunting for the mice behind the screen! Well January is nearly over at Hotel Cat and we are convincing ourselves that signs of Spring are all around! We have had a very busy month and met a delightful number of cats. The one thing that really is apparent is how well they have all settled in. We have had a couple of very shy cats stay, but due to the fact that they have plenty of places to watch us from and get to know us, we have become part of their world very quickly. The feeling you get when you are best friends with a cat who didn’t want to know you 24 hours earlier is fantastic and a big part of why we created Hotel Cat. We have a virtually full diary for February and are really looking forward to meeting all our new guests. They range from four month old kittens right up to a 16 year old gentleman who loves to lay on a chair and watch the chickens from his window. 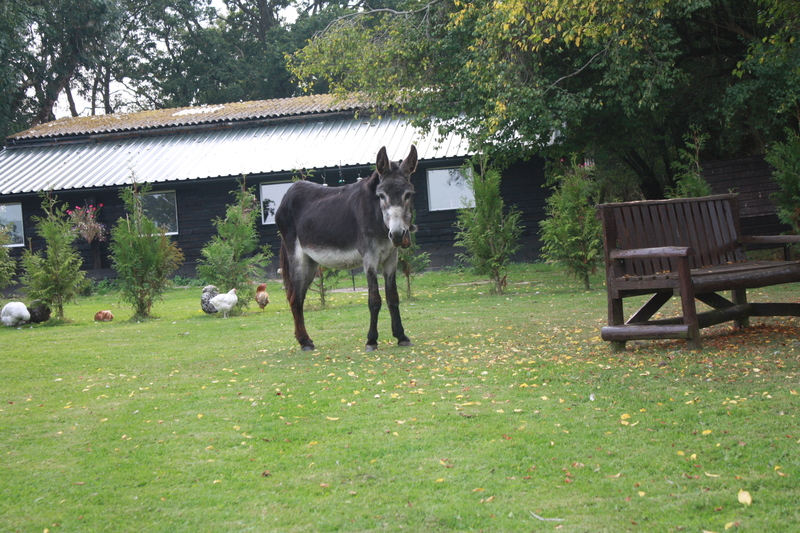 The donkeys are very much looking forward to Spring arriving as they miss sunbathing! Basil has stayed really well as the winter has been relatively mild and his arthritis has been kept at bay. We have been in talks with a couple of TV production companies who are putting cat themed shows together. I’m sure that we have a number of guests who would pose for the camera the minute it was pointed at them! 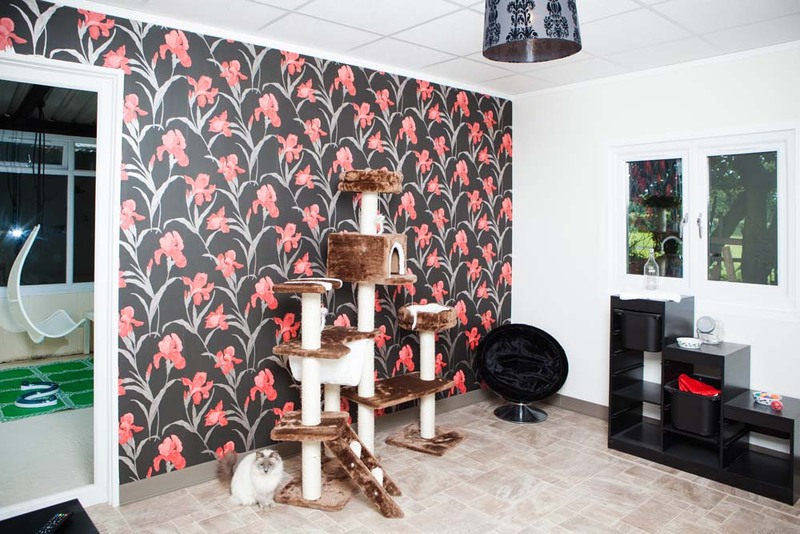 As ever, if you are thinking of leaving your precious cats and would like to come and have a look around or luxury cattery, then we would be delighted to meet you. Happy New Year from Hotel Cat! We had a wonderful Christmas and New Year, spent with the most adorable cats who came to stay. The only sad bit is when they go home as we all miss them so much. The cats all loved their individual Christmas presents from Santa Paws & Mrs Claws and all tucked in to their Christmas dinner of turkey, chicken and salmon. Now 2015 is upon us we have a variety of new guests coming to stay. We love meeting the different cats, from the exotic to the everyday cat, they are all so unique and fascinating. It is lovely when parents turn up with bagful’s of things from home to help the cats settle, there is plenty of room in the suites and the more familiar things the cats have in their suites the nicer it is for them. If you are thinking of leaving your precious cat/s with us in our hotel and have any concerns about how they will settle, please call us for an informal chat or alternatively come and see us and we will be more than happy to show you around at a convenient time to suit yourselves. We were thrilled to be asked to be involved with the company Fish4Cats. Many of you will know all about their well known brand Fish4Dogs, which is a very popular premium natural food. Well, they have recently launched Fish4Cats alongside. We have trialled Fish4Cats on our own cats and on a number of our guests too. They have all, without exception, loved it. 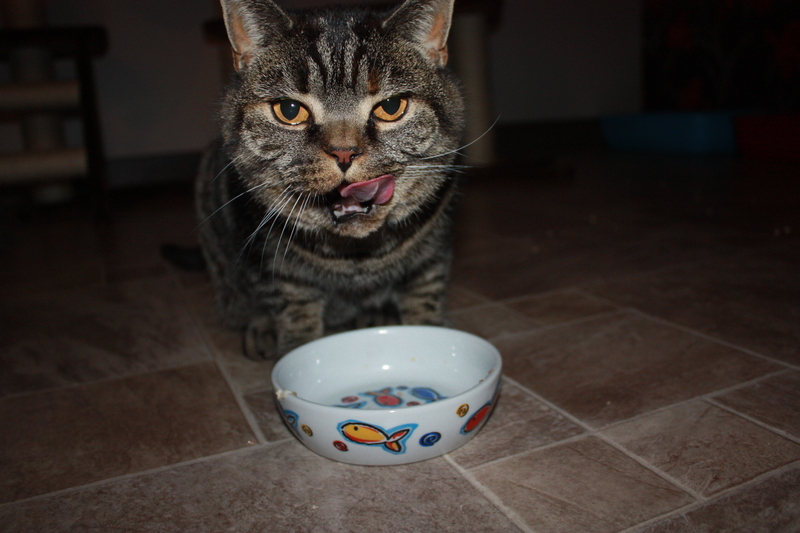 The complete kibble is crunchy and smells lovely and the fish mousse is gone as soon as it is put down. The complete food contains high fish levels -65% fish content and is obviously extremely good for your cats coat and general condition. With added algae – a rich and sustainable source of Omega 3, added Cranberries and ideally balanced amino acid and mineral profile of fish to aid with urinary tract infection. We have had numerous other journalists visit and the publicity has been fantastic, we already have bookings for Christmas 2015! The Cat Hotel is looking very festive and our large sparkling Christmas tree has a huge box of gifts underneath ready to be distributed on Christmas morning. I think we are all more excited about our guests presents than our own and each one has been carefully selected to suit the individual personality of each cat. We have a wonderful selection of guests and will post photos on our gallery in the New Year. The majority of our guests have never stayed away from home before and understandably their parents are always anxious about how they will cope. The truth is that every cat who has stayed so far has settled in really well. 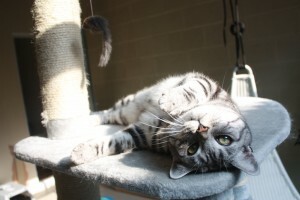 We do ask that you bring plenty of familiar bits from home to leave in their suites and all of the cats relax into their new surroundings very quickly. It is important to remember that we are with your cats all day at their calling. They have an awful lot of one to one time throughout the day and late into the evening. I have posted a couple of photos of brother and sister, Florence and Ravello. Their Mum and Dad were very worried about how they would cope here and whether they would eat. The truth is they are very relaxed, eating well and adore watching all the animals wandering outside their window. 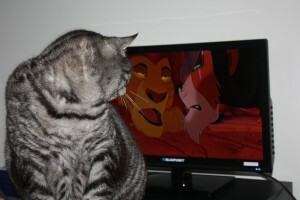 Ravello also loves to watch Lion King on the television, he is so funny and always jumps on the table when I switch it on, it’s quite apt seeing as how his parents have gone on safari! Comments Off on We’re in the news! We are all looking forward to the lovely guests who are booked in for Christmas stays, we have a lovely bunch coming to stay and are busy choosing presents to suit their individual personalities. Our Christmas tree is going up at the weekend and all our guests have presents with their names on to go underneath. I think we are all more excited about their presents than our own! With winter now showing it’s head the cats are being kept well entertained by all the birds on the feeders. Our trees are fast losing their leaves and the chickens are having great fun scrabbling around under the leaves for bugs. The cats are all lovely and warm in their suites and it is so lovely to see them all happy and content, it’s what we wanted to achieve and is so fulfilling. We have had some beautiful and very entertaining guests coming in, each one unique as all cats are. Frankie & Vinnie the gorgeous British Blue’s have had their second stay and kept us busy as their personal entertainers during their holiday. The other firm favourite past time of all of our guests is spider hunting! The spiders come into the garden rooms in search of somewhere warm and dry and become prey, poor things, but cats will be cats! We were also very fortunate this month to have a two page write up in Cat World magazine, it is on page 30 and can be read here http://www.catworld.co.uk/imag/issue440/index.html. Our hotel is now starting to book up quickly and everyone who comes to see it is very complimentary which is lovely. We always love showing people around, so even if you do not yet have a trip planned, you are very welcome to come in and meet us – and if you want to make friends with the donkeys, sheep and goats then remember they love digestive biscuits! Autumn has been showing signs of it’s approach this week, the leaves are starting to turn on the trees around the cattery and the nights are chillier. The cats are lovely and warm in their bedrooms at night and can sunbathe during the day in their garden rooms. I thought I would introduce you to our lovely pet donkeys over the next few weeks. The first one is Basil, or to give him his full name, Basil Faulty the Wonky Donkey! Basil came over to England in January 2008 from Portugal. A local charity was organising the rehoming of a number of donkeys from a rescue centre over there that was closing due to the couple who ran it becoming too ill to continue. Basil was not in the rescue centre, but the lady who was organising it found him collapsed at the side of the road, with men beating him to make him stand. They only stopped after she offered a large sum of money for him and so he joined the others on the long journey back to England. When he arrived to us he had collapsed and it took six of us to half carry him over to his new stable, we also rehomed another donkey called Cookie who was in a better state. We rugged Basil up and he recovered slowly over the next two weeks and our other two donkeys Holly and Charlie were very excited to meet him. He was terribly thin and covered in sores and burns. He has a huge lump of bone sticking out the side of his jaw which must of been so painful when he was wearing tack, goodness knows how it happened in the first place. Our vet did months of remedial work on his teeth, they had never been rasped and were making his gums bleed every time he ate. They x-rayed his mouth and estimated him to be between 30-35 years old (donkeys can live until they are 50). Basil is a cantankerous old man and when he has had enough fuss he will generally bite you! We know this and can read the signs! He also chooses when he will have his feet trimmed and the farriers know better than to try if he is in a mood! Having said that, after what he has had to endure, who can blame him? We love seeing him having a lovely retirement and from not expecting him to live through the night on that cold January evening that he arrived, to still having him almost six years later seems like a miracle. The photo was taken 23rd September 2014 and although he is bonier than last year he is still very well in himself and very much loved. It has been a wonderful first summer for us all. We have finished our fabulous Cat Hotel and the feedback has been over-whelming. 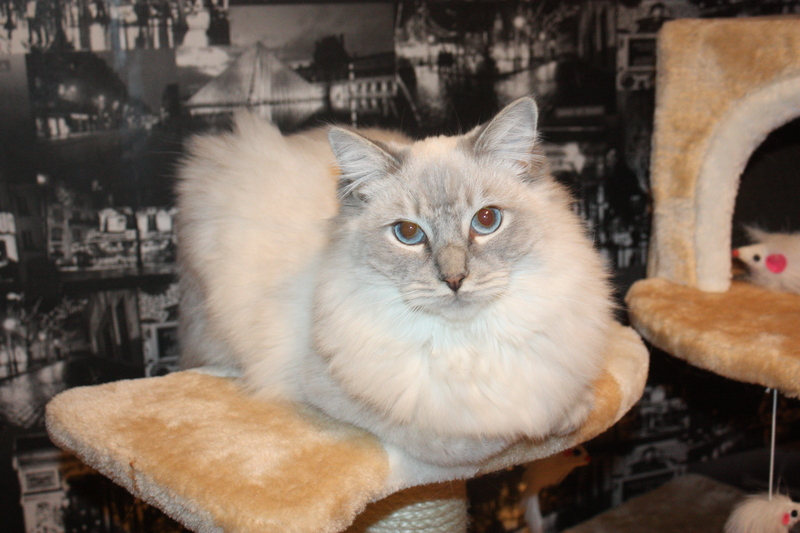 Our cats, Nou, Doumy and Sid think it is a great place and have really helped in choosing the best toys, cat trees and cosy furniture. We only moved to the New Forest in October 2013 and have been really busy since we arrived. Hotel Cat used to be a barn, it has now been completely changed and is totally unrecognizable. We have 20 acres of the most beautiful land and want to farm it ethically as we are totally against killing anything. Our egg business is going really well, we rehome hens and they stay with us for life – our oldest girls are nearly seven years old and still lay occasionally. They all free range which gives the eggs a lovely flavour, you will see them on the approach to the hotel as they wander where they like! They are also very friendly as they get plenty of titbits during the day, their favourite is digestive biscuits! We cut hay off of our fields this year, we left wide strips un cut under the trees and hedges as we have resident deer. The female deer had two beautiful babies this year and we are lucky enough to see them everyday. We are delighted with our new lifestyle and the cats think the farm is a great place too. 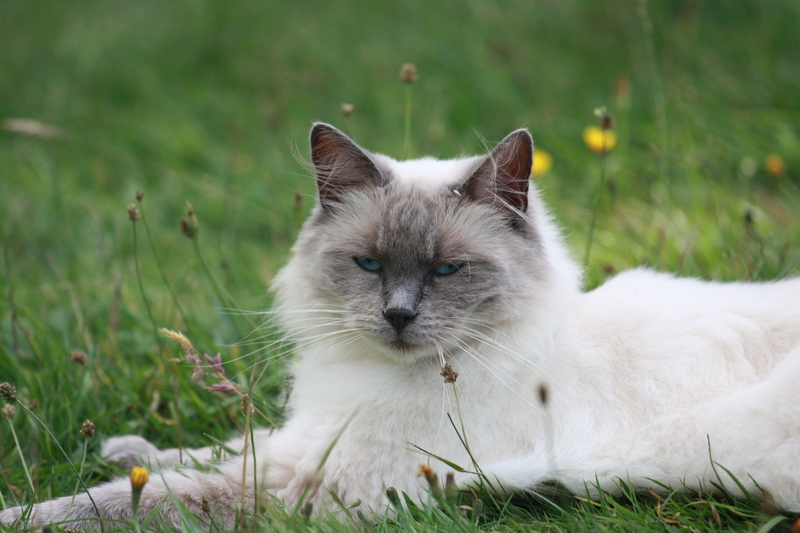 Nou, our Ragdoll who thinks she is a dog walks round the farm with us twice a day, we call her the supervisor and she takes her role very seriously. Next year we are hoping to plant lavender in one of our fields and we are in talks with various groups who would like to help scythe the hay by hand and plant new hedges, there are interesting times ahead. Tallulah meeting Uncle Tim for the first time!